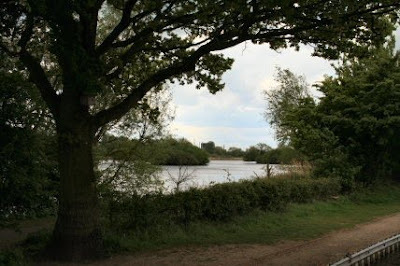 Only a few tens of yards away is the A38. The canal runs through a corridor of countryside which is much nicer than seeing the cars and lorries racing past. 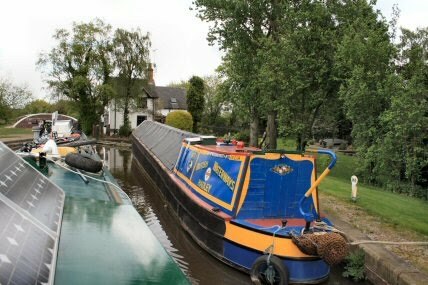 First lock of the day and moored at the side of it is an old narrowboat in the colours of the once British Waterways fleet. 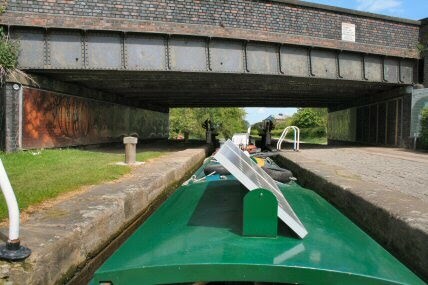 I stopped for a while at the bottom of the lock to let another narrowboat go past. 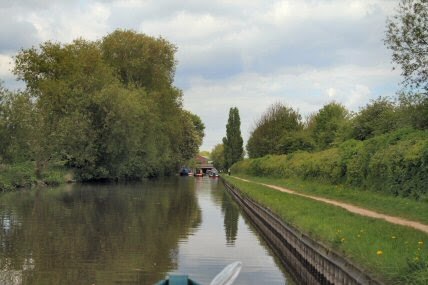 I only do about 3 mph and get caught up with quite quickly especially as I don't rush the locks. Within seconds of moving on I spotted this rather large family. 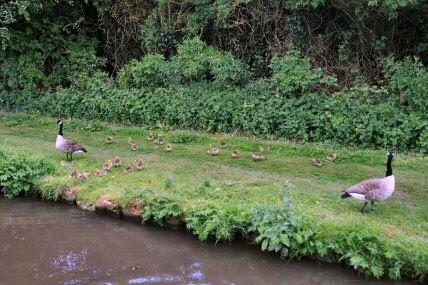 I counted 22 goslings. It is small wonder that there is a cull going on in parts of the country to try and keep the Canada Geese numbers down to manageable levels. Another of the carved benches put up along the canal. 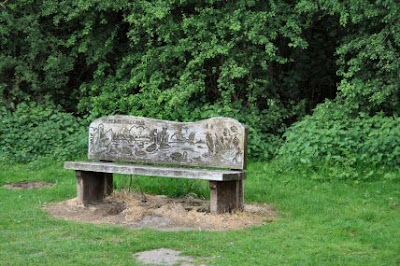 I saw on this one that it has something to do with the fact that Stretton to Alrewas is all part of the National Forest. Coming up to Branston village and the Branston Water Park is on both sides of the canal. 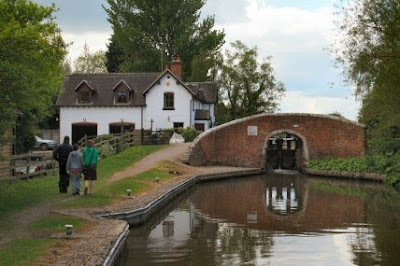 Access from the towpath and footpaths all round it. 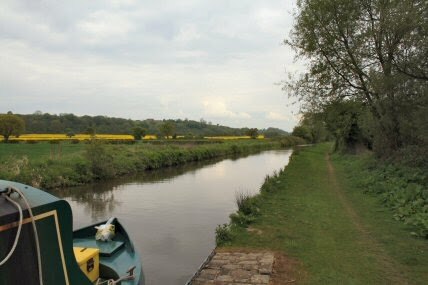 Branston lock and the edge of the village.This is where Branston Pickle is supposed to get its name from. Coming up through the lock when I arrived was this couple. Their boat isn't much to look at but it is their pride and joy. 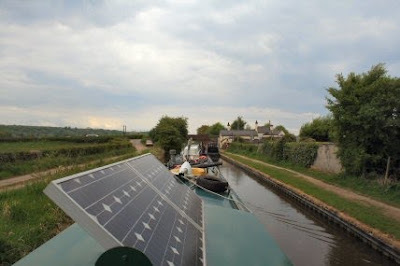 The engine was U/S with a bent crankshaft so they were bow hauling it back to Coventry. What surprised me was the number of boats that had passed me today and not given them a tow at least to a lock. 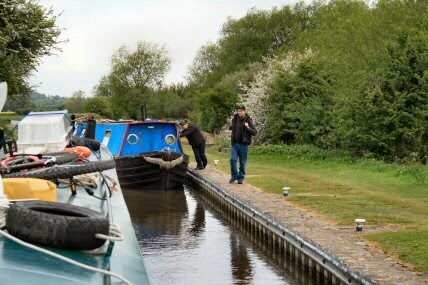 Ok a number were hire boats and they wouldn't think about it but a lot were with owners onboard. Too busy thinking about keeping their paintwork bright and sparkly no doubt. 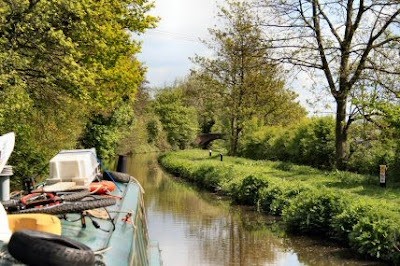 Stopped again just below the lock to make a cup of tea and let another of the hurry brigade through. 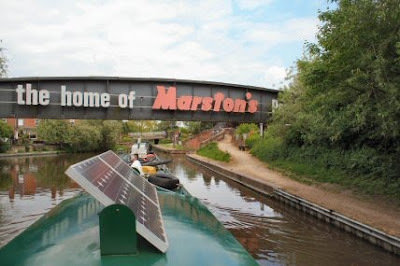 Burton on Trent and just in case you didn't know that it was a brewery town then hints are left about for you. There is now a cycleway along side the canal instead of the A38 and the entrance has a couple of seats like butterflies and the swan here. 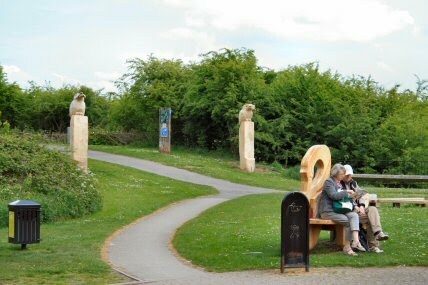 The two guardians on the pillars are Kingfishers. The last of the narrow locks. Dallow Lock has been spruced up with a large muriel :-) on the underside of the bridge but either they are still working on it or half of one side has already been removed for the plywood underneath. I shall be quite lost going through the large locks on my own. Still in Burton on Trent and still with a bit of countryside nearby.